A one day National CME on Interstitial Lung Disease was organized by Chest Care and Research Society in association with Department of Pulmonary Medicine, Era's Lucknow Medical College & Hospital, Era University, Lucknow & Uttar Pradesh Tuberculosis Association on 19th May, 2018, at Hotel Clarks Awadh, Lucknow. The event was inaugurated by Prof. M.L.B. Bhatt, Vice Chancellor, King George's Medical University, Lucknow . Prof. D. Behera, Professor, Department of Pulmonary Medicine, Ex Dean, PGIMER, Chandigarh, was the Guest of Honour. Prof. Farzana Mahdi, Director (Academics), Prof. M. M. A. Faridi, Principal, Dean and CMS, Era's Lucknow Medical College and Hospital and Shri. R.C. Tripathi, Chairman U.P. T.B. Association graced the occasion and Prof. Abbas Ali Mahdi, Vice Chancellor, Era University, presided over the function. Prof. Rajendra Prasad, Director, Medical Education and Head Of Department, Pulmonary Medicine, Era's Lucknow Medical College, President Chest Care Research Society and Organizing Chairman, informed that ILD is a heterogenous group of acute and chronic inflammatory and fibrotic lung disease involving interstitium of lungs of known and unknown causes and its prevalence is increasing. 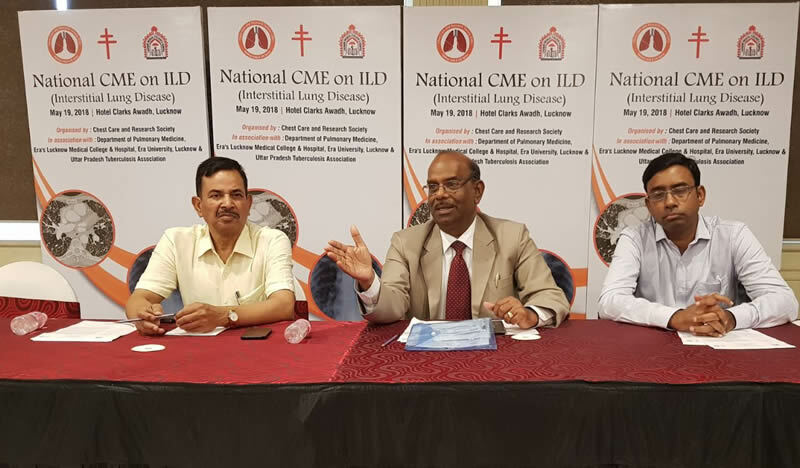 A National CME on ILD is being held for the first time in UP. Prof. D. Behera, Professor, Department of Pulmonary Medicine, Ex Dean, PGIMER, Chandigarh, Dr AlokNath, Head, Department of Pulmonary Medicine, SGPGI, Lucknow, Dr Virendra Singh, Director, Asthma Bhawan, Vidyadhar Nagar, Jaipur, Chief Editor, Lung India, National Coordinator, ILD India Registry, Dr Deepak Talwar, Director, Metro Institute of Health Science, Noida, Dr Rajkumar, Director, Vallabhai Patel Chest Institute, Delhi, Dr Bhavin Jankharia, Consultant Radiologist, Trustee - Radiology Education Foundation, Mumbai, Dr Ashok Kumar Singh, Senior Consultant, Regency Hospital, Kanpur and Prof. Surya Kant, Head of Department of Pulmonary Medicine, King George's Medical University , Lucknow delivered lectures on various aspects of Interstitial Lung Disease. Three special ILD Board, in which cases from various institutes like SGPGI, KGMU and ELMCH were also discussed in detailed. The CME which began at 9:30 am on 19th May, 2018, at Hotel Clarks Awadh, Lucknow was attended by various dignitaries, private practitioners, medical college faculty and residents.